The following submission is the first place winner of The Albert and Mary Lasker Foundation 2016 essay contest. You can read the original posting here. Modern medicine has worked miracles: we have cured infectious diseases with vaccines, replaced failing organs with transplants, converted many cancers from death sentences into treatable conditions. But one area has lagged far behind the others: the brain. Psychiatric illnesses are some of the most widespread and poorly treated conditions. The problem? Our treatments are too broad. We have many drugs to treat psychiatric diseases, but instead of just adjusting the activity of certain neurons in an affected region, they change the function of the entire nervous system. The consequence? A laundry list of harmful side effects. Thus, finding new, precise ways to treat psychiatric disease is a critical endeavor. Dopamine producing cells (red) in the ventral tegmental area of the mouse brain. Fortunately, tools for better psychiatric treatment already exist thanks to an ongoing revolution in basic neuroscience research. Two technologies in particular have transformed our ability to precisely manipulate neurons: optogenetics and chemogenetics. In optogenetics, light- sensitive molecules, known as opsins, are inserted into the cell membranes of a given population of neurons. These opsins are ion channels that open in response to light and thereby enhance or suppress the electrical activity of neurons. By applying laser light to the neurons expressing the opsins, you can rapidly alter the cells’ electrical activity. Scientists have used this method to control a variety of animal behaviors such as eating, sleeping, learning, mood. One major shortcoming of optogenetics is the need for a fiber optic cannula or a cranial window in the skull to deliver laser light. A potential solution that could bring optogenetics closer to the clinic is the use of red-shifted opsins, which are activated by a lower energy laser that scatters less when traveling through tissue, allowing light delivery external to the skull (1). Chemogenetics employs a similar strategy to optogenetics, but it replaces light with a more traditional activator—drugs. The most popular variant of chemogenetics is DREADDs: designer receptors exclusively activated by designer drugs. DREADDs were developed by altering existing cell membrane receptors so that they instead respond to a designer drug, clozapine N-oxide (CNO). CNO was selected because it is otherwise inert in rodents, so no matter where the CNO is administered it can only produce an effect at its designer receptor. Like opsins, DREADDs can excite or inhibit the electrical activity of neurons, depending on the receptor from which the DREADD is derived. The DREADDs can be activated at any time by administering CNO as you would any other drug. The key advancement of chemogenetics over standard pharmacological treatment is the ability to restrict DREADD expression, and thus CNO’s effect, to a specific population of cells using a combination viral genetic technique. DREADDs are delivered to a region of interest via intracranial infusion of an adeno-associated virus (AAV). These viruses are capable of infecting cells, but they have been robbed of their ability to replicate, preventing harmful spread. Scientists can alter the DNA sequence of the virus to contain different gene and promoter combinations. The gene determines the protein product, DREADDs in this case, and the promoter region determines which cells can initiate transcription of that gene. For example, the promoter region for agouti-related peptide (AgRP), a signaling molecule that increases appetite, would cause DREADDs to be expressed only in cells that also produce AgRP. One group of researchers used that very approach to investigate how the activity of AgRP-producing cells in the arcuate nucleus control eating (2). They found that after injecting an excitatory DREADD into the arcuate nucleus, the administration of the designer drug CNO caused an increase in food consumption. When an inhibitory DREADD was used instead, the mice ate less. The study provided some of the first evidence for the role of these neurons in controlling feeding behavior. Many additional studies have successfully used DREADDs to demonstrate the importance of distinct cell populations in previously uncharacterized behaviors. One group of scientists used DREADDs to investigate the role of the suprachiasmatic nucleus (SCN) in controlling the circadian rhythm, which regulates cycles of sleep and activity (3). Remarkably, the researchers could reprogram the circadian clock just by activating a small population of SCN cells. Another study sought to understand the mechanisms in the hippocampus underlying the formation of fearful memories (4). 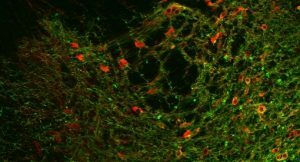 By inhibiting certain cells in the hippocampus, the researchers could prevent the formation of the contextual fear memories so detrimental to post-traumatic stress disorder patients. These studies are just a small sample of the many discoveries DREADDs have afforded. Their findings have not only enhanced our knowledge of the brain; they provide new approaches to treat conditions that have few efficacious treatments. The most common prescriptions for PTSD, for instance, are selective serotonin reuptake inhibitors (SSRIs). SSRIs act by increasing the amount of the chemical messenger serotonin throughout the entire nervous system. Such a broad effect explains why SSRIs have numerous side effects, including sexual dysfunction, nausea, and insomnia. Treating PTSD with DREADDs would avoid all of these complications because the drug would only have an effect on the group of neurons involved in the fearful memories. Two barriers remain between DREADDs and the clinic. Injecting the DREADD-containing AAV requires intracranial surgery, restricting recipients to the neediest. But there is precedent for successful use of AAV in humans: a 2007 clinical trial improved movement impairment in Parkinson’s Disease patients (5). The other consideration is the designer drug. Although CNO is inert in rodents, the human body occasionally converts it to clozapine, an antipsychotic drug. One alternative is the drug perlapine, which is approved in Japan for the treatment of insomnia. It has a very high affinity for DREADDs, so at small doses it could activate the receptors without risk of off-target effects(6). Because it is already approved for use in humans, perlapine may be the best bet for a DREADD clinical trial. These obstacles are only temporary and pale in comparison to the promise DREADDs hold for treating psychiatric illness. We must now harness the level of precision DREADDs and optogenetics provide to develop better psychiatric treatments. Visit our Health Library to learn more about when to seek treatment for mental health concerns. Dr. Barrow is an associate professor of pharmacology and molecular sciences. His team translates basic research on the causes of mental illness into new pharmacological targets for future medications. Learn more. Learn more about neurology research at Johns Hopkins Medicine.